Toothache can be one of the most painful experiences. Gums or periodontal infection can be the site of the pain. Wisdom teeth can be painful as they emerge. The pain can also be coming from the nerve of the tooth – usually bacteria have reached the pulp. A cracked tooth can also be painful, whether bacteria or there or not. The sooner you can be seen by a dentist the better. If we are closed however, there is some emergency advice and phone numbers are available at the Bytes Dental Ballina website. Use painkillers as directed on the packet until you can be seen. We will book you in as soon as we can. Please EMAIL us now, with all the details. Sensitive teeth. Slight sensation when brushing or scratching the tooth. Reactive to cold. A toothbrush can strip away the gum when used incorrectly. 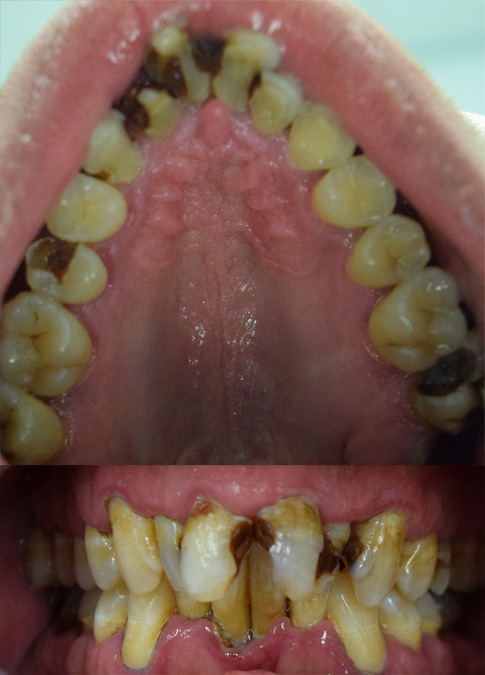 Brushing from side-to-side has caused this gum recession over a lifetime. Sensitivity starts where the enamel is missing. You may be suffering dentine hypersensitivity, caused from loss of enamel. Dental enamel is the very hard protective coating covering each tooth. It is formed in early childhood and does not replenish over a lifetime. Once the tooth has lost enamel, it is gone for good. Teeth can lose enamel from grinding (including brushing too vigorously), bacterial attack (dental decay), acid erosion (from acidic fluids like lemons, cola’s and stomach acids), and from receding gums. Pain when biting. Pain could be short and sharp, like a zing when biting on a certain spot. A cracked tooth will zing with pain because the nerve is being triggered as the crack is activated. Teeth do not repair themselves very effectively, and once a crack starts, it usually gets worse. The aim of treatment is to remove the cracked portion of the tooth, and cover over the gap. Cracks can be unpredictable. The sooner the diagnosis is made, the simpler the treatment can be. If a tooth is cracked beyond requiring a simple filling, a crown may be advised. 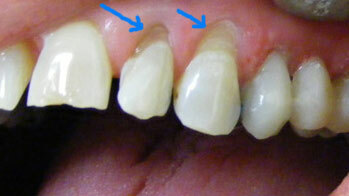 A crown will embrace the tooth to help support the fracture. If the pain is quite intense, the crack may have propagated to the pulp causing pulpitis. Pulpitis can recover if attended too quickly enough, or it can end up as a traumatised nerve that does not recover. If the tooth sensitivity has become tooth pain, then see below. Pain when Biting – Alternatively pain may be more diffuse or dull and lingering for hours. Tooth is tender to press or tap. Pain to eating – Food or sugar or drinks cause the pain. Most of this decay came from failing to use dental floss. Bacteria feed on sugar and carbohydrates. If there are gaps or holes in the tooth where food can get stuck, decay can occur. The sooner the bacteria can be removed and a filling placed, the better the chances that the tooth can recover. If the bacteria are too far into the tooth, the pulp will become inflamed and no amount of filling will save the tooth. Sometimes a filling is placed to wait and see if the tooth recovers. If pain persists, see your dentist. Cold sensations is the body’s way of letting you know there is a problem. 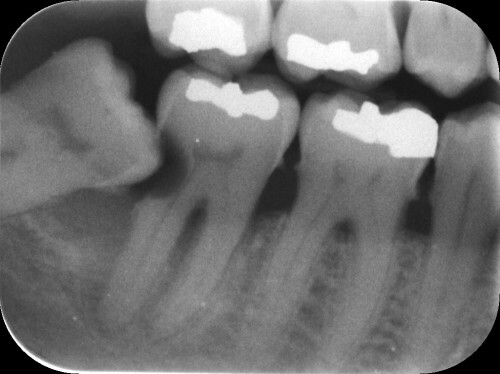 If the reason is a loss of enamel on several teeth, the diagnosis would be sensitivity. Teeth can also become cold sensitive when the nerve is traumatised – either from dental decay, leaking filling or a cracked tooth. There is a good chance the dentist can save the tooth because a cold reaction is a mild symptom. The news is not so good for hot reactions. When the pulp of the tooth becomes infected, it can either be an intense pain requiring pain killers, or it can be a more dull, diffuse pain. 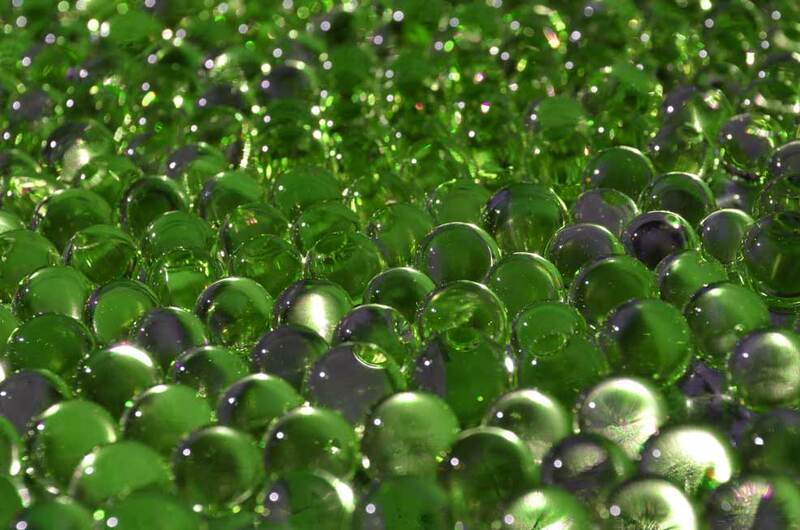 The reaction to hot is believed to relate to an expansion of gas that may be trapped inside the pulp. As the gas expands it pressurizes the nerve and creates pain. Gas could come from the bacteria trapped inside the tooth. These bacteria will need removing – either by venting the tooth and cleaning out the pulp canal, or by removing the tooth completely. When the pulp is traumatised, the pain can be very intense. Irreversible pulpitis means the pulp is so inflamed and sore that it will not recover. At this stage of toothache, the pulp needs to be removed ASAP. This can either be via removal of the entire tooth, or by removing the pulp tissue in a therapy called root canal therapy. Either way, the tooth would be anaesthetised. Options on whether to have the tooth pulled out or saved are here. Bacteria can get through the tooth and travel down the canal until they come out into the bone. This will usually follow a bout of pain at some stage, though sometimes the swelling can come years after the original tooth pain. Dental swelling needs to be taken seriously as bacteria in the head and neck can travel to the brain and cause serious problems. Attend the dentist ASAP. Drainage of pus is the primary concern. The tooth may be removed, or root canal treatment can be started ASAP. Antibiotics are helpful when there is pus involved. Do not rely on antibiotics alone. The infected tooth must be treated. 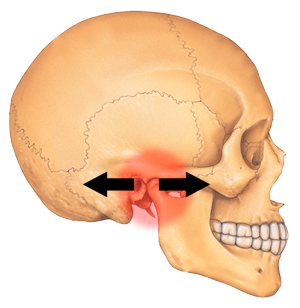 Pain in the joint of the jaw bone is called TMD – Temporo Mandibular Dysfunction. It is associated with high stress levels which create tension in the muscles around the joint. This joints can also become stressed when the bite of the teeth is not in harmony with the swing of the jaw. This can happen with crowded teeth, orthodontic movements of teeth, or extensive dental work. Anything that stresses the joint should be avoided – like opening too wide, or clenching the teeth. The aim of treatment is to reduce stress levels, and take pressure of the joint. A dental grinding splint or occlusal splint may be advised. Wisdom teeth push through the gums around 18 – 20 years old. This normal eruption can happen without much awareness, or it can be quite painful. Your dentist will Xray the jaw and see if the teeth have room to erupt into the jaw. Not all wisdom teeth need to be removed. Pain can come from the breakdown of healthy tissue around the tooth to allow it to push through the jaw bone and gum to erupt into the mouth. Numbing gel like baby teething gel can help numb the area, as well as paracetamol taken as required. If the area is not kept clean with daily hygiene, bacteria can settle around the erupting tooth and inflame the gum even more. Sometimes the dentist will be able to remove some of the gum tissue, if it is flapping and preventing your toothbrush from cleaning effectively. This is a simple procedure done under local anaesthetic to help the tooth emerge and stay clean. The wisdom tooth has created a plaque trap, resulting in massive decay in the neighbouring tooth. The tooth with the hole in it had to be removed. If there is not enough room for the wisdom teeth, or they are erupting sideways, it may be better to have them removed. Your dentist may do this procedure in the chair under local anaesthetic, or else refer you to an oral surgeon. We recommend the Drs Bilski and Dr Shannon Webber. When pain cannot be attributed to any dental problems, we need to consider other more rare anomalies. Tissue pathology may include ulcers, viral infection, sinusitis, benign tumours, cancerous tumours, bone tumours, or other medical conditions. Trigeminal Neuralgia is a painful neurological condition that often gets mistaken as a toothache. Your dentist will test all of the teeth in the effected side, and determine if the pain is dental or not. We will refer you onto a neurologist or your GP for further tests. 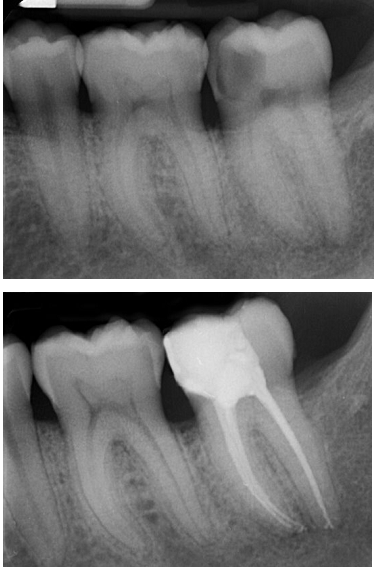 Expect some recovery time after a deep filling. There may be some residual pain from the injection site. The tooth may remain tender for a few days due to the dental work, and disturbances near the pulp. If the sensitivity is improving day by day then it is a good sign. It sometimes takes weeks to settle properly. If the tooth is getting worse day by day, then contact your dentist. A high filling (interfering with closing your teeth together properly) can be eased. Contact the dentist immediately if the filling is high, as prompt adjustment will take the stress off the tooth and aid recovery. If the tooth is more sensitive than before or is aching, then the pulp may not have survived, despite the dentist’s best efforts. An irritated pulp that does not recover within a couple of weeks, or pain that is getting worse, needs attention from the dentist. Usually the pulp will need to be removed – either by root canal treatment, or removal of the whole tooth. Sometimes the filling can be replaced for a temporary sedative filling containing oil of cloves. A “wait and see” approach is then taken to see if the tooth will recover. The success of this technique is variable, and needs to be weighed up by the dentist and the patient. The aim of RCT is to remove infected or traumatised pulp from the canal. After the anaesthetic wears off, there may be a some pain where the pulp has been detached from the tooth. This should fade within a day or 2. If there was an abscess under the tooth (infection that has spread beyond the tooth and into the bone) there will be a lot of healing to go on after treatment. There may also be some swelling. Contact your dentist if you are feeling ill or feverish, as antibiotics may be indicated. If the pain is not improving by day 3, contact your dentist. It may be possible that the pain is coming from a different tooth. Try to identify which tooth the pain is coming from. There will be pain as the socket is healing. Day 3 tends to be the worse, and then lessening each day thereafter. The amount of pain is dependant on how difficult the extraction was and whether there was any bone removal. 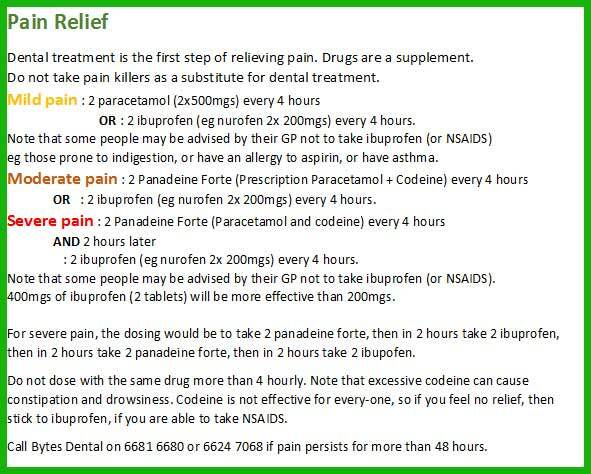 With bone removal the pain can be worse so rely on painkillers (below). Post operative care instructions are here. The patient is a smoker, or has other health limitations. The blood clot has come out of the socket, leaving the bone exposed. Hygiene: Food and plaque falling into the socket, and not being removed regularly. Bone is exposed, due to an odd shaped socket. Contact your dentist if you have concerns about pain or bleeding after an extraction. Drugs are the last on the list because they are the last option in dealing with dental pain. Your dentist will advise on the best dental treatment so that you do not need to take drugs. However, drugs can be very helpful in combination with proper dental treatment. Pain Relief Medication: Assuming there are no medical reasons that you cannot take certain medications, this regime can help. Antibiotics: Should only be considered when there are signs and symptoms other than pain, ie redness, swelling, fever or feeling ill. Your dentist will prescribe as required.